Cheeses There are 14 products. The cheese is a type of food made from curdled milk from sheep, goat, camel, or other mammals. It is usually consumed as if it were another Iberian sausage, but it can also occur in so many ways that it served as a condiment or ingredient for many recipes. Among the most common forms is processed cheese, grated cheese, cheese in slices or huntable. In addition, this also can be classified depending on the type of cure cheese: fresh, semi-cured or cured. 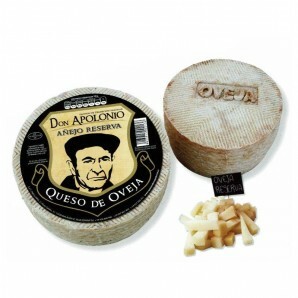 Mezcla Abuelo Apolonio Cheese. 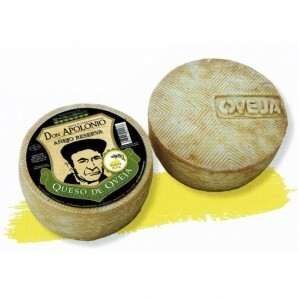 Weight: 6,6 to 7,4 libs Mezcla Abuelo Apolonio Cheese is a family tradition cheese made ​​with milk from cows, goats and sheep , and coated with extra virgin olive oil . This cheese has a weight between about 3 and 3.4 kilograms .Cheese mix is fashionable , any fan of good cheese can not miss the opportunity to probarlo.El best-selling cheese in our store. Mezcla Abuelo Apolonio Spicy Cheese Weight: 3 lbs Mezcla Abuelo Apolonio Spicy Cheese is a family tradition cheese made ​​with milk from cows, goats and sheep , and has a very nice touch picantinto .This means cheese weighs about 1.4 kilograms.It is a mixture with a very gentle healing and a spicy touch that makes it irresistible to the palate cheese. Pure sheep cheese Viejo Pablo Alonso Martín Provenance: Zamora Weight: From 3.1 to 3.3 Kg. Cheese made with sheep's raw milk. Old cheese with a minimum of 12 months of healing in cellar, equipped with a strong personality, with an exquisite bouquet for the most demanding palates. Takes several hands of Virgin olive oil in its bark, in his court there are a few not-very-large eyes called eye of Partridge. Romero Cured Sheep Cheese Provenance: Ocaña (Toledo) Weight: 3.6 lbs (1.6 kgs) Cheese manchego origin, made with raw milk from sheep and goats, with a curing fatty and matured in olive oil. It is a strong-flavored cheese, but it is not hard to the touch. With a maturity of 18 months. Its flavor and creaminess makes it a delicious cheese.